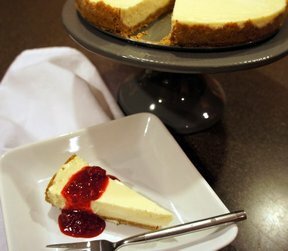 This creamy cheesecake is one of the best you'll try. the lemon zest doesn't overpower but adds that little bit of freshness. Impress your guests with this dessert. 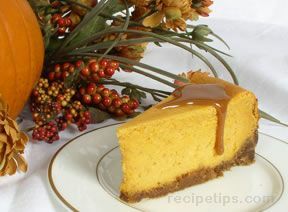 In a mixing bowl, combine the crust ingredients with a fork until evenly moistened. Lightly coat the bottom and sides of an 8-inch spring form pan with non-stick cooking spray. Pour the crumbs into the pan; then using the bottom of a measuring cup or the smooth bottom of a glass, press the crumbs down into the base and 1-inch up the sides. Beat the cream cheese on low speed for 1 minute until smooth. Add eggs 1 at a time and continue to beat slowly. Gradually add sugar and beat until creamy, 1 to 2 minutes. Add sour cream, lemon zest, and vanilla. 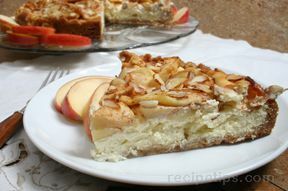 The batter should be well-mixed but not overbeaten. Place the springform pan in a large roasting pan. Pour boiling water into the roasting pan until the water is about halfway up the sides of the cheesecake pan; the foil will keep the water from seeping into the cheesecake. Bake for 1 to 1 1/4 hours. The cheesecake should still jiggle, so be careful not to overcook. Let cool in pan for 30 minutes. Chill in the refrigerator, loosely covered, for at least 4 hours. Unmold and transfer to a cake plate. In a small saucepan add all the ingredients and simmer over medium heat for 5 minutes or until the fruit begins to break down slightly. Leave to cool before spreading on cheesecake. 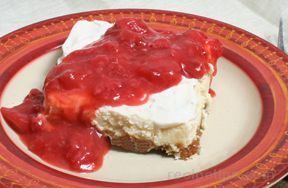 Using a spatula spread a layer of the topping over the surface of the cheesecake. "This is truly the ultimate cheesecake. I liked that it was a little thinner than a normal cheesecake. I made it with raspberry sauce and had to double the sugar since the raspberries are a bit more tart."